OneRepublic lit up London's Roundhouse as they kicked off their UK tour last night (16.03.14). Frontman Ryan Tedder started the 90-minute Camden show by singing behind a giant white curtain, before it dropped to the floor and he bounded about the stage singing 'Light It Up' backed up by his band. Despite admitting he was "fighting a cold", Ryan, who has written hits for everyone from Beyoncé to James Blunt, proved why he's also an in-demand singer and musician, after his band achieved phenomenal success with their hit single 'Counting Stars', which has had more than 211 million hits on YouTube. They launched into 'Secrets' before shots of Abbey Road flashed up on a huge screen, along with scenes of a masquerade ball from their video for 'All The Right Moves'. Ryan told the audience: "We've valued the UK quite possibly more than any other place we've toured from day one," which resulted in huge applause and the band were treated to 'What You Wanted' before the musician pulled out an acoustic guitar for 'Stop And Stare'. 'Something I Need' moved the crowd and was one of the highlights of the night before Ryan performed 'Apologize', his hit duet with Timbaland, as his neon piano flashed from red to blue, creating a stunning visual effect. Ryan laughed and engaged in banter with a fan after they threw a giant pair of underpants onto the stage, which he described as "disgusting", adding, "They're much too big for me to wear." His energy and soaring vocals were nothing short of surprising for those who hadn't yet witnessed the undercover king of pop live on stage. Guitarist Zach Filkins's solo session of looped flamenco sounds also stunned fans, while bassist Brent Kutzle showcased his talent on the cello. OneRepublic closed the show with 'Life In Color' and the anthemic 'If I Lose Myself', as confetti cannons were let off and the band hit giant glowing drums, creating a party atmosphere. Fans were left wanting more, while those who doubted the band were made to eat their words. Mainstream pop/rock outfit from the US who have enjoyed the patronage of hip super-producer Timbaland and have swept all before them commercially in the last while. 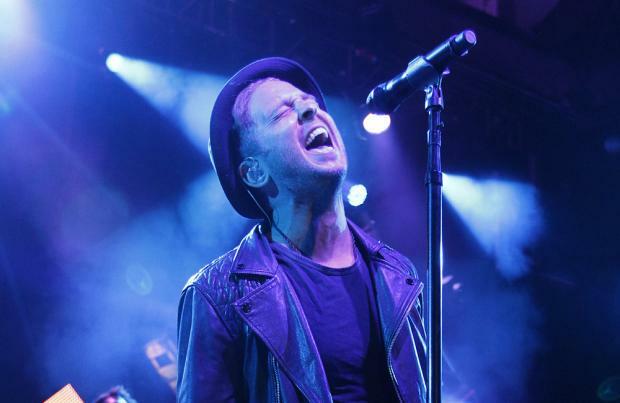 Frontman Ryan Tedder is also the individual to hold responsible for Leona Lewis's 'Bleeding Love'.